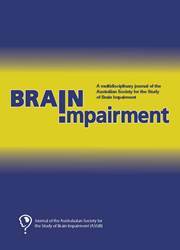 The journal addresses topics related to the aetiology, epidemiology, treatment and outcomes of brain impairment with a particular focus on the implications for functional status, participation, rehabilitation and quality of life. Disciplines reflect a broad multidisciplinary scope and include neuroscience, neurology, neuropsychology, psychiatry, clinical psychology, occupational therapy, physiotherapy, speech pathology, social work, and nursing. Submissions are welcome across the full range of conditions that affect brain function (stroke, tumour, progressive neurological illnesses, dementia, traumatic brain injury, epilepsy, etc.) throughout the lifespan.